Foremaster Tool, in business for 44 years now, continues to see robust business, and they are thankful for their loyal customers. They are diversified in the industries they serve; their parts span the automotive, oil and gas, medical, aerospace and defense, and entertainment industries. Their customers number in the dozens, with some regionally and national well-known entities including; ATK, TD Williamson, Peterson, Kimberly Clark, AutoLiv, and Parker Hannifin, to name a few. • Investment in technology - Brian says that his father, Peter Foremaster, who founded the company, believed in buying new machine tools and believed in buying high quality machine tools. He says, “Peter bought his first machines from Tracy Smith of Smith Machinery.” He continued, “Since I have taken over the business, I continue to purchase from Smith Machinery, now from Tracy’s son Clark Smith.” Brian values the fact that Mazak is manufacturing a many of their machine tools here in the United States, in Florence, Kentucky. 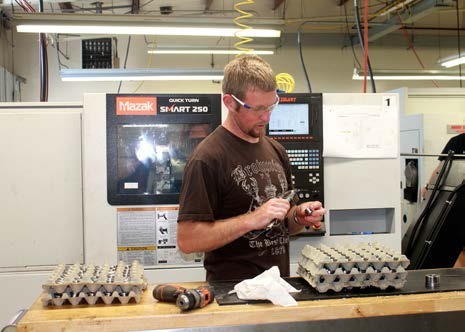 Brian and the team at Foremaster Tool Precision Machining have long wanted to move to the next level in precision machining -- which naturally meant purchasing a 5 axis machining center. 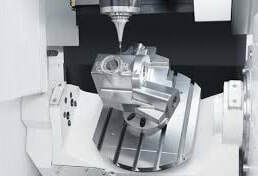 Though they could machine the parts their customers sent to them, they were doing it with 3 and 4 axis machining, using fixturing, and necessarily the part took more set-ups than it would take with 5 axis machining. 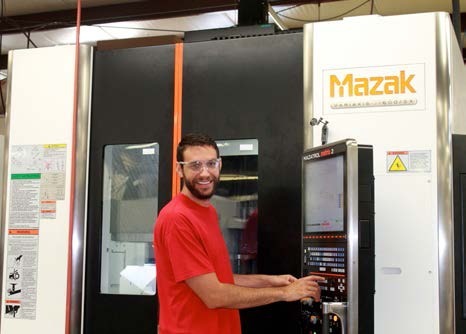 Though Foremaster Tool is a Mazak shop (they do admit they have purchased a few machine tools other than Mazak -- when the Mazak isn’t available in the timeframe or in the features they need), Brian was just a little apprehensive about purchasing such a new product that Mazak offered. He says, “The VCU-400 5X is an entry level 5-axis machine, and it was new on the market.” He continued, “It hit my price point, but I wanted to be sure it would meet my expectations.” Brian contacted some machine shops on the east coast that were using the machine, and when he heard how satisfied they were, Brian and the team at Foremaster Tool made the decision to buy their first 5 axis machine, the Mazak VCU-400 5X. Lynn says that this machine is a space saving machine with a 5-axis rotary/tilt table. Lynn says that the Mazak VCU-400 5X VMC resulted in such significant set-up reductions and quality improvements that the company made the decision to purchase their second 5-axis machine just 6 months later. “We have been using Foremaster Tool for more than 2 decades now. I support my company in the R&D department, and so most of the work I do with them is for prototypes. We do sometimes send production work to them. We value our relationship with Foremaster for a number of reasons; their pricing is competitive, their quality is outstanding, and their on-time delivery is good.